Volunteers needed for Thurston County Fair to have fun demonstrating and assisting fair goers in Weaving, Spinning or Felting. Volunteers will be given a free entrance ticket for a three hour commitment. Please let Gail Trotter getrotter@comcast.net know which Day and Shift and what you would like to share at the fair. Volunteers will be given a free parking pass and one free ticket to the fair. A bonus for our fun time will be the OWG gets income. Needed are 4 people each for a 4 hour shift, Morning, Midday or Night . You can work on a fiber project of your choice. Bringing items hang for a display are welcome too. Please let Gail Trotter know which shift you would like to volunteer for and she will get back to you about exact times. Please note the following Friday will be the guilds turn at Sheep to Shawl and volunteers will be needed for that too. Come share and learn paper making. Contact Gail Trotter getrotter@ccmcast.net if you will come. She will send out more details on supplies needed. This Full Turn Twining Class will cover starting, the rim and color change on a small Salla Bag designed by Ardith Hamilton. See the results from the 1st class. http://olympiaweaversguild.org/wp-content/uploads/2017/04/owg-anwg-basket-report.pdf Twining technique http://basketmakers.com/topics/bytechnique/twined/twiningtech.htm can be done with many different fibers and is not limited to typical basket reed. There will be a minimal cost to cover materials provided, based on number of students. Students will bring additional materials. Contact Gail Trotter getrotter@comcast.net if you would like to be on the list for this class. She will send out more details on student cost and supplies needed. Also if you were in the 1st class and wish to finish your bag or share your knowledge you may come too, just let Gail know what you will be working on. 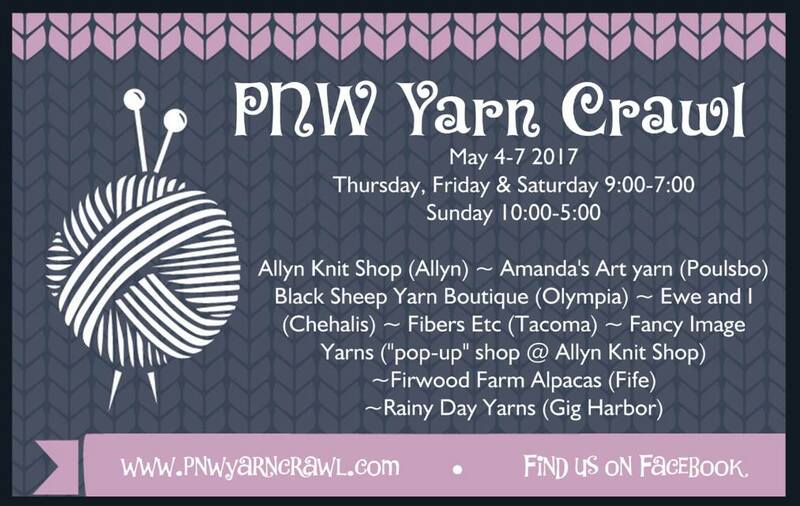 The 2017 PNW Yarn Crawl is from May 4 through May 7. Daily Drawings, Free Patterns, All Shop Mystery Pattern, & More.